UC Santa Cruz students will have more time with the stars, thanks to a generous donation from a local company. Watsonville-based Orion Telescopes has made a gift of 10 portable telescopes for field use by students, creating greatly enhanced opportunities for observing in introductory courses. "This gift means many more possibilities for students to have actual hands-on experience," said Rachel Dewey, associate adjunct professor in astronomy and astrophysics. "I also expect the telescopes will be used in some of the K-12 outreach programs UCSC participates in." All of the donated telescopes are "Dobsonian," a style named for John Dobson, an amateur astronomer who developed and popularized the concept. Dobsonians are widely appreciated for their mounting system, which makes transportation and setup easy and reliable. "Orion is the recognized industry leader in Dobsonian telescopes," said Patrick Gillis, who manages Orion's worldwide reseller division. "We saw this support as a wonderful opportunity for us to continue our partnership with an outstanding research university." Orion has also cosponsored an astronomy conference at UCSC and donated binoculars for use by the Predatory Bird Research Group. Orion's gift comprises eight Skyquest XT8 telescopes and two Skyquest XT10" IntelliScopes, along with cases to protect the telescopes in storage and transportation. Both models have similar optical quality, but the IntelliScope includes a computerized locator with more than 14,000 objects in its database. "The user enters a target, such as a specific galaxy," said Gillis, "and the object locator will guide the viewer to the target. The computer can also sort by category, such as planets, galaxies, or nebulae to help the viewer learn and enjoy the night sky." Because the IntelliScope is moved to its target by hand, rather than utilizing a motor, the mechanisms are more durable. 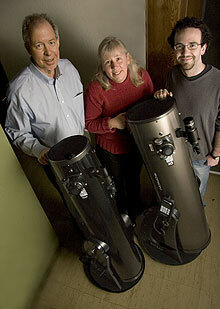 "These are robust telescopes," said Dewey. "I would expect that if we're as careful as we intend to be, students will be viewing with these telescopes for the next 15 years or more."